Moving from a city-sized, 25-ft.-x-125-ft. Chicago lot to my current 1.3-acre site has meant a mindshift for me. In my former home, I could see the entire backyard from a single spot – hell, I could almost spit from the back door to the detached, lot-hugging garage with a little effort. Here, I feel a bit like one of those ranchers in “Giant,” whose spreads stretch out as far as the eye can see. O.k., so the house itself is basically riding 6A’s breakdown lane. The backyard, though, stretches back through a full acre of trees, raspberry vines and wild grape – lots and lots and lots of wild grape. I’m not sure what, if anything, the land was originally. A good portion of it was once cleared, so it may have been farmland at one time. But I think it’s been pretty much left on its own for the last 10 or so years. Just re-establishing some of the old paths is like acting out a part in some National Geographic special. I keep wondering when I’m going to come across an ancient tribe of head-hunting Puritans, or a colony of sea captains gone missing on their way over to Harwich’s harbors. The local conservation officer tells me the wild grape is a native plant here, but it sure acts invasive on my property. It has climbed up over the field of bush honeysuckle that has taken over a good 50 percent of what I grandiosely call my “back 40,” to create a sea of broad, waving leaves. The vines also have reached up most of the trees, as well, spreading out across branches and smothering out all available sunlight. Some of the vines are almost as big around as one of my arms (granted, I have kinda skinny arms), and have begun pulling over the weakened, sunlight-deprived trees. There certainly are other obnoxious plants on the site. The green briar and bittersweet climb just as high, and the green briar’s thorns are sharper and longer than my 12-lb. cat’s claws. There also are big patches of wild raspberry, which were flavorfully productive this summer, but are running out of control in broad swaths. 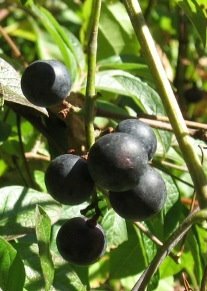 But, while these other feral varieties each seem to thrive in relatively restricted areas of the yard, the grape grows everywhere – sun, shade, dry or marshy, every location seems to be right where it wants to be. Over the summer and into the early fall, as I’ve been opening the old, previously established paths back up, I’ve been cutting many of the tree-climbing grape vines at their bases, hoping that the trees’ leaves will once again be able to see sunlight and photosynthesis will once again allow the trees to prosper. Then, as grapes began to ripen in fat, juicy clusters, my realtor, who has become a good friend and doubles as a local Martha Stewart, suggested we harvest some of the crop to make our own jelly. So, I slowed down on the clearing to ensure better picking. Well, life got in the way of domestic productivity and the grapes started to pass their prime before we were able to gather their bounty. But a few days ago as I was wandering in the back, trying to figure out which of the overgrown pathways to attack next, I caught the most amazing scent. It was like I was walking past one of Welch’s factories. For some reason, I always thought that grape jelly smell was something manufactured, a byproduct of artificial coloring and high-fructose corn syrup. What I smelled in my woods was a lighter version of that sweet, fruity aroma, but it was still there, like one of those undertones connoisseurs speak of when discussing fine wine. It flowed with the breezes, wafting and fading with the rustling leaves, a new sign for me that fall’s turning leaves and frosty weather are soon to come. Now, going forward, I think I’ll be approaching the grape vines with more respect. I still want to rescue my trees from the smothering coverage and provide walkable routes to the back of my land. And, given the sheer quantity of vines, it would be unlikely that anything short of an aerial Round-Up bombardment could rid me of them, anyway. But, even so, my clear-cutting ways are over. In addition to providing for a potential jelly crop, I want to make sure there are enough of those bulging purple pearls to ripen and burst in odorific splendor. The smell is addictive, but fleeting – the kind of thing mass-market candlemakers attempt, but fail to master. And, I predict, enjoying its passing presence will, in time, be added to my list of seasonal pleasures unique to Cape Cod, along with exploding springtime daffodils and lazy summer swims. Five years and one week ago today, I was two days into a week-long visit to Provincetown, taking a break from my job as a Chicago-based consultant. 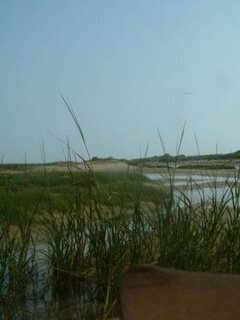 I spent much of that week completely engaged by “The Outermost House,” wandering the bike trail dunes and studying the tidal changes of Herring Cove. Reading Henry Beston while wandering the cove’s grassy marsh as the tide returned, first trickling in with herring fry at its forefront and then flowing waist deep only 15 minutes later, felt like an immersion course in the ecology of tidal marshes. The weather was early-September perfect, with that touch of approaching fall mixed in with the clear skies and mid-70s temperatures that can make early fall so perfect on the Cape. I felt cocooned by sand and sea and a small town that seemed to exist in a dimension unique to that particular nexus of latitude and longitude. Five years and one day ago today, by date, at least, was a Monday. I was back at my desk in Chicago, still high from a week of sun, sand and salt water, trying to explain to my co-workers the miracle of the cove and the tiny fish, and the gulls that migrated back every 12 hours to feed on that tide’s batch of herring and crab. It’s a place I’d move to in a heartbeat, if I could, I said. Sitting across from me, my friend Mary drew a plan for the vehicle she believed could make this relocation happen – a bicycle pushcart set up to vend freshly-shaken martinis to Herring Cove beachgoers. It would surely earn me the money for a nice little P’town condo, she argued. Five years ago today I was back at that desk, booting up the computer a few minutes before 8 a.m., central time. For some reason, I wasn’t able to get to the New York Times website, the usual accompaniment to my day-starting coffee. The office network is just kludg-y today, I figured, until Mary showed up a few minutes later. “Did you hear about that plane hitting the World Trade Center?” she asked. So then I tried CNN.com, and it was overloaded, too, as was WashingtonPost.com and every other online news resource I could think of. A few minutes later she was back with her coffee and the news that a second plane had hit a second tower, and soon, a gathering number of us were circled around a conference-room t.v., watching Peter Jennings narrate that now-iconic video feed. Within 45 minutes, as news that the Sears Tower, sited diagonally across the street from our own office building, was being evacuated and the second tower to be hit became the first to collapse, we were told to pack up and go home. Take your laptops, we were told, because no one knew when we’d be coming back. Down on the street, as I made my way to the el, it was like evening rush hour at 9:30 a.m. Mayor Daley had ordered the Loop to be evacuated, and I blended in with the crowd of other workers who had suddenly found their day had been fast-forwarded. Almost everyone, it seemed, had a cellphone to an ear, providing a real-time update as my Brown Line train headed northward – the North Tower had collapsed, there really had not been a car bomb at the State Department, that out-of-touch plane had crashed into the Pennsylvania countryside. Once home in my condo, which sat directly under the flight approach to O’Hare, the skies were eerily free of jet noise, in that kind of silence that falls in the countryside as birds and other animals sense an approaching storm. Only the sound of the occasional fighter jet pierced the quiet, as I picked up the uninterrupted news coverage where I’d left off, glued to the sofa in front of the television for the next 12 hours straight. Today, I’m sitting at a different desk watching that video feed all over again. CNN.com is streaming the tape of its Sept. 11, 2001, coverage in real time today, and watching it is providing an experience of sense memory I wasn’t expecting when I first clicked on the “start” link. The most heart-affecting point for me was at the beginning of this re-broadcast, which started about 10 minutes before the first plane struck. What one saw was a brief glimpse into a time before the numbers 9-1-1 became anything other than an emergency phone number – an insipid interview with a maternity-clothes designer, a check on the weather, that annoying morning-show banter- and no mention of terrorism, or IEDs or that phrase that epitomizes the term “oxymoronic,”: homeland security. My setting is very different today, as I watch this five-year-old rebroadcast. Instead of staring directly into the raised back of my friend Mary’s laptop screen, I look out a window at the scruffy Cape Cod woodland that is my new backyard. I made it to the Cape, albeit Brewster and not sky-high-priced Provincetown, even without that martini push-cart (but the idea is still a possibility, so I’ll come after you if you try to cash in on it without me). I’m hoping to be here five years from now, when, possibly, that video feed rebroadcasts again. But I can’t help but wonder, what will the context be in which we recall those events of what will then be a decade in the past? Just 10 minutes before American Airlines Flight 11 tore a hole into the Trade Center’s north tower, we were oblivious to the extent our lives would change just 10 minutes later – that we’d soon be routinely slipping off shoes before airline flights, staring concernedly at a backpack left behind by a forgetful tourist and even eyeing neighbors suspiciously simply because they followed a religion we didn’t understand. That such acts could occur was simply inconceivable to us then, at that moment five years and 10 minutes ago. I pray they could be just as inconceivable, again, when we watch that tape five years from now.